One of the biggest questions in education is the extent to which schools can make a difference to the lives of the children they teach. Put more fatalistically, if you’re born poor does that mean you will perform poorly at school? 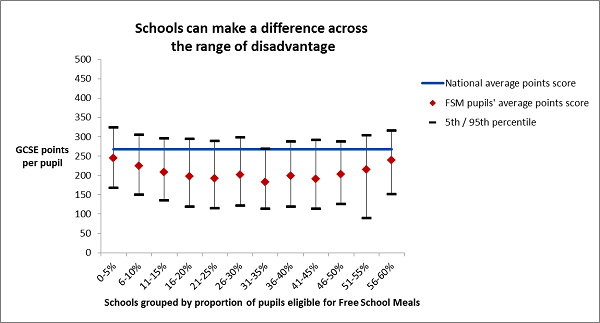 Based on data we’ve researched, we can see that in 2010 there were 446 secondary schools (1 in 7 schools in England) where the poorest children — defined here as those eligible for free school meals — achieved better results at GCSE than the all-pupil average. It’s an encouraging and important finding which shows a significant number of state schools are helping ensure those children perform well in the exams which will play such a large part in deciding what career/study options are open to them later in life. It does, of course, also show we’ve a long way to go. As the graph we’ve produced shows, there are large ranges in GCSE performance even between schools which have similar pupil intakes (at least as measured by their household income). Closing the attainment gap which exists between children from the poorest backgrounds and all other pupils has to be the starting point for any social mobility agenda. Learning from the success of those schools which have successfully narrowed gaps without lowering overall attainment, and then sharing evidence of what appears to work best with those schools where big gaps exist, is a practical step in equalising opportunities for children.